As the season of Lent continues, join us on Wednesday, April 10, at 7:00 p.m. in the Sanctuary for a candlelight Communion service that includes a homily by the Reverend Todd E. Leach, the Lord’s Supper, and music offered by Chatham Baroque and the Chamber Choir of the Pittsburgh Girls Choir. Childcare is provided. Lenten vespers continue on Wednesdays at 7:00 p.m. through April 10. These 45-minute candlelight Communion services in the Sanctuary of Shadyside Presbyterian Church include a homily, the Lord’s Supper, and music offered by the Shadyside Strings, Chatham Baroque, and the Pittsburgh Girls Choir. Childcare is available. Find more Lenten opportunities at Shadyside Presbyterian Church. 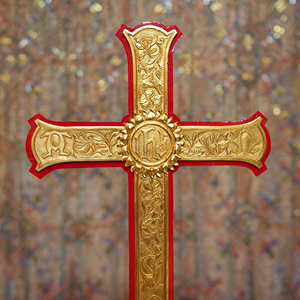 Photograph: Detail of the cross located on the Communion table in the Chancel of the Shadyside Presbyterian Church Sanctuary. The inscription of “IHS” in the central medallion is a Christogram symbolizing Jesus Christ. The monogram is taken from an abbreviation of the name of Jesus in Greek. Photograph taken by John Mahood, Imagebox Productions.